Boats There are 22 products. 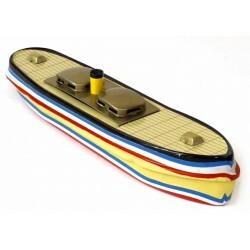 Pop pop boat with luxury, speed boat / cruiser stylings. Comes with candle, engine, candle tray, pippet, and instructions. 18.5cm. Made in India. 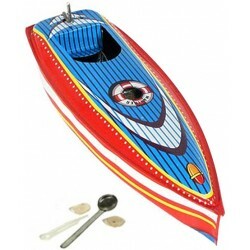 Bright and brash pop pop boat with big chimney. Comes with candle, engine, candle tray, pippet, and instructions. Made in India. 17.5cm. 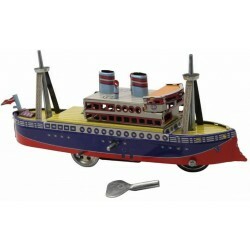 Multi-gunned, tin toy, wind - up battleship. Early 20th century style battleship with both painted on and attached cannons. There is also an observation deck, lifeboats, a little Spanish naval / civil flag, and even a crows nest near the top of the mast. 20cm approx. 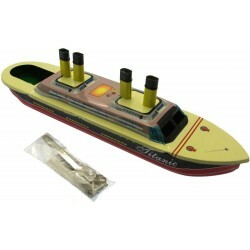 Self-propelled barge pop-pop candle boat. 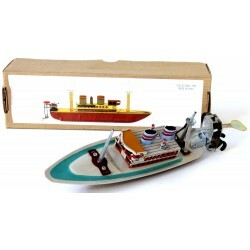 Sleek, beautiful, well detailed pop pop boat. Comes with candle, engine, candle tray, pippet, and instructions. Made in India.